We know how complex certification systems can seem to those who don’t live and breathe them. That’s why we don’t just provide certification services – we take the time to communicate our findings in a way that’s meaningful to our customers, helping them create a real impact. You can be sure that any information you receive from us will be accurate, unbiased and credibly sourced, as well as straight-forward and accessible. We believe that the way we communicate certification services is a measure of the quality of our service. Being able to understand and act on the feedback we provide is key to your satisfaction, and directly affects the impact our work has on your business. Want to know more? Please download our Quality Policy (English PDF). At FLOCERT, we practice what we preach. Since 2007 we've been accredited against the internationally recognised ISO norm for product certifiers, which is ISO 17065 today. Seeking independent verification of our own quality ensures we're continually strengthening our organisation and staying true to our vision. It demonstrates how committed we are to leading the way in fair trade certification. 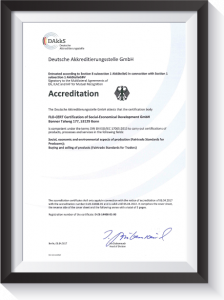 To be accredited we are regularly audited by the German National Accreditation body DAkkS. The certificates we issue can be trusted by everyone in the fair trade market. Our audit findings and certification decisions are made independently, based on rigorous evaluation. Our staff and auditors are able to meet your needs expertly and efficiently. All of our services are of the same high quality. We treat all our customers equally. We have a quality management system in place to constantly monitor and improve our services. We are always open to feedback on our services and decisions. Almost all product-specific Fairtrade Standards (except gold and the section on ‘Requirements for operators in the cotton chain' of the Fairtrade Standard for Fibre Crops). Impartiality: Our independence is one of our key assets. We have a unique governance system and an independent financial structure, to make sure our certification is always impartial. When things don't turn out as planned, our fair appeals and grievance redress processes ensure that all customers are treated equally. Technique: In pursuit of excellence at all times, we continuously train our auditors to an exceptionally high standard. Those that are ready to audit are given ample time to conduct professional evaluations, using best practice methods and world class social audit techniques. Information management: Our state-of-the-art IT application systems are in place to guarantee that our transparent interactions with customers are always confidential. The information records we gather during audits and certification processes are handled carefully, and we have specific dedicated documents to help our staff gather and access information easily and meet expectations. All these documents are strictly monitored under a document control system. Quality Improvement: We're continually reviewing and improving our processes and performance using innovative evaluation methods and internal audits. Our highly qualified auditors and staff actively participate in improving our systems. you would like to send an allegation, means you’re concerned that a FLOCERT-certified customer is not conforming to Fairtrade Standards. you would like to submit a complaint because you’re unhappy with the service you’ve received from FLOCERT. you want to appeal a decision about a Fairtrade certification or ask for a review of an evaluation decision related to detected non-conformities, suggested corrective measures or objective evidence. How to contact us: you can use the forms on this website, send an email to credibility@flocert.net or give us a call. We can guarantee that your submission is strictly confidential, and we’ll take care to avoid any conflicts of interest in our decision-making. In the name of credibility and transparency, we always deal fairly with queries regarding our decisions and the conduct of our staff or any of our customers. We strive to give our customers the best experience possible. 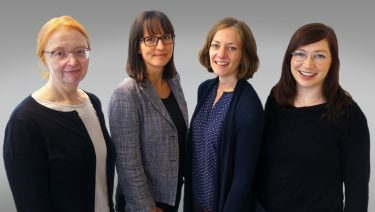 If you don't feel satisfied with the way your complaint, allegation or appeal was handled, please contact one of FLOCERT's supervising bodies: the German National Accreditation Body (DAkkS) or the standard setting organization, Fairtrade International. I want to appeal against FLOCERT’s decisions about Fairtrade or EDGE certification. I think someone else is not conforming to Fairtrade Standards. I want to complain about the way FLOCERT delivers its services. When did you receive the Evaluation or Certification letter from FLOCERT? What decision do you wish to challenge? Which FLOCERT Compliance Criteria is concerned? Who is your allegation against? What is the set-up of that organization? Please share your concerns here. Your comments will be automatically sent to our Credibility Assurance team. We will get back to you shortly. Contact us for any quality questions you may have!